The movement to ban nuclear weapons based on their unacceptable humanitarian consequences took a step forward on Thursday at the historic first UN General Assembly high-level meeting on nuclear disarmament. Not so much a debate as a collection of prepared statements, much of the meeting was taken up with the predictable refrains of pursuing “a step by step approach to disarmament” and the need to “create the conditions for nuclear disarmament.” However, there was an energy and determination in the room as well, fuelled largely by the continued and welcome shift in focus away from a discourse where the nuclear-armed states set the terms of the debate and towards a more confident approach by non-nuclear-armed states who appeared less and less willing to accept business as usual. References to the humanitarian consequences of nuclear weapons were commonplace, as were calls for prohibitions on nuclear weapons. 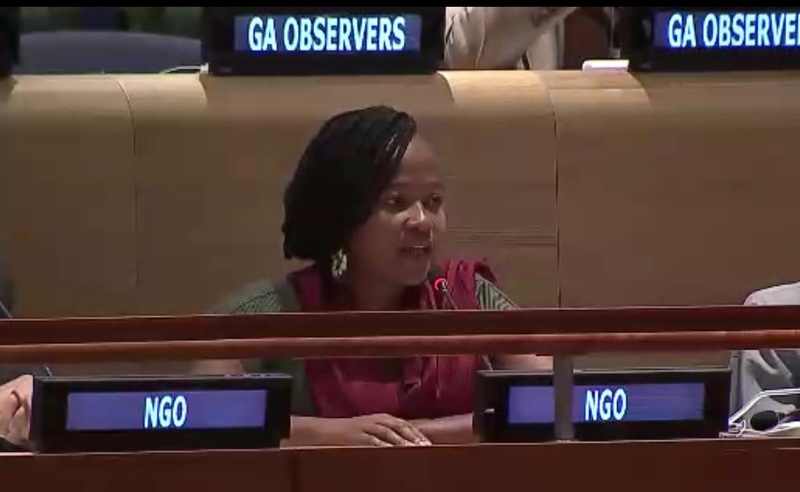 States such as Algeria, Brazil, Nigeria, Malaysia, Austria, Ireland and many others highlighted the importance of this new focus on addressing the humanitarian impact of nuclear weapons, further preparing the ground for the negotiations on a ban treaty being proposed by civil society under the banner of the International Campaign to Abolish Nuclear Weapons. “A treaty banning nuclear weapons is achievable. It can be initiated by states that do not possess nuclear weapons. Nuclear-armed states should not be allowed to prevent such negotiations. We should not abandon productive or promising efforts in other forums, but neither should we ignore the opportunity that lies before us now, to make history. History shows that legal prohibitions of weapon systems—of their use or their possession—facilitate their elimination. Weapons that have been outlawed increasingly become seen as illegitimate. They lose their political status, and so do not continue compelling money and resources to be invested in their production, modernisation, proliferation, and perpetuation. The ban on nuclear weapons will raise the political and economic costs of maintaining them, by prohibiting assistance with the development, production, or testing of nuclear weapon systems. In a defensively worded joint statement, France, the UK and the US revealed how much their grip on global discussions around nuclear weapons has slipped in recent months, as the focus continues to shift towards recognizing and addressing the humanitarian consequences of nuclear weapons. For Article 36 and ICAN, an important step in addressing this impact is to start work on a new treaty banning nuclear weapons. The Mexican Foreign Minister invited all states to attend the second international meeting on the humanitarian consequences of nuclear weapons, to be convened on 13-14 February in Nayarit on the country’s Pacific coast. This forthcoming conference in Mexico, as well as the Oslo conference on the same topic last March, which around 130 states attended, stood out as the most significant source of new ideas and promising initiatives presented during the discussion. Statements from the meeting are available on the Reaching Critical Will website.